With the help of the local chief's daughter Pocahontas he made Jamestown one of the first settlements of the New World a success. Jamestown Cottage overlooks the village green, with just a short walk to the village pub. The cottage has a mature garden with own 5 seat HOT TUB set in private gardens, with table and chairs under a veranda for Al-fresco dinning. Off road parking and a welcome pack of local produce is provided for week bookings. 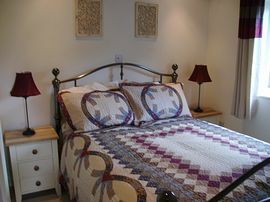 Jamestown Cottage has one double bedroom with wardrobe, radiator, hair dryer, mirrors and bedside tables with lamps. There is a walk-in tiled wet room with under floor heating, heated towel rail and mirror with shaver/toothbrush socket, shower, toilet and basin. 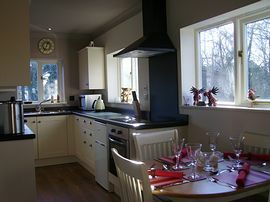 The kitchen includes a hob, oven, fridge/freezer, microwave, ironing facilities, dishwasher. washer/dryer, waste-disposal and all kitchen utensils, tableware and saucepans. The open plan lounge has an enclosed gas remote control living flame stove. 26" Television, DVD/CD recorder/player, Freeview and French doors leading to the patio area. Situated in a charming historic village. Quiet countryside, and long sandy beaches. All on one level apart from one step. Tea towels, bath sheets, and bed linen provided. One dog by arrangement at extra cost. £30 for 1 £40 for 2 dogs. 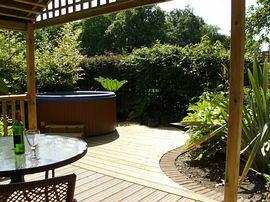 Own private 5 seat Nordic HOT TUB on decking with veranda, set in own private garden. Local Services: Pub within walking distance serving food, garage with small shop, bus service, church. Jamestown Cottage is situated in the grounds of Old Rectory Cottage, which is 100 yards on the left at the 'T' junction from the Willoughby Arms. £275.00, 1st January/31st March 2015. £300.00, 1st April/31st May 2015. £325.00, 1st June/30th June 2015. £350.00, 1st July/31st August 2015. £250.00, 1st October/18th December 2015. Bank Holiday weekends: Fri-Mon £350.00. 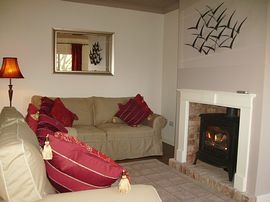 Christmas/New year weekends: Fri-Mon £350.00. Please visit our site for up-to date availability, prices and offers. Friday to Friday OR Monday to Monday. Monday to Friday 4 nights.